Wiesbaden, 2015-8-18 — /Travel PR News/ — Norwegian Escape, soon to be the largest ship in the Norwegian Cruise Line fleet, was floated out of Meyer Werft’s covered building dock II on Saturday, August 15 in Papenburg, Germany, where the 164.600-ton ship has been under construction since September 2014. Beginning at approximately 09:15 local time, the 4.200 passenger vessel, with her signature hull artwork designed by famed marine wildlife artist and conservationist Guy Harvey, departed building dock II. Norwegian Escape is the first ship in the line’s Breakaway Plus-Class, measuring over 330 metres in length and 41 metres wide. 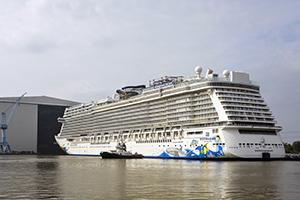 Norwegian Escape’s float out represents a major milestone in the vessel’s construction, with the ship being well on her way to completion she will now move into the final phase of construction with delivery taking place on October 22, 2015. Following the ship’s float out, the next milestones will be mounting the ship’s signature Norwegian Cruise Line funnel and taking thrills to new heights by adding a third storey to Norwegian Escape’s ropes course, due to be the largest at sea. Norwegian Escape’s conveyance down the river Ems towards the North Sea is scheduled for September 16 (weather permitting). Following inaugural events in Europe and Miami, USA, Norwegian Escape will sail 7-night Eastern Caribbean cruises departing every Saturday from Miami beginning on November 14, 2015. From the ship’s eye-catching hull artwork to thrilling waterslides and ropes course, Norwegian Escape, as the first ship in the Breakaway Plus-Class, represents a true evolution for the Norwegian brand, incorporating guest favourites and providing further freedom and flexibility for guests. Norwegian Escape will sail weekly 7-night cruises from her year-round homeport of Miami to the Eastern Caribbean beginning on November 14, 2015. The 164.600-gross ton ship will be the largest ever to home port year-round in Miami, carrying 4.200 guests to tropical Caribbean destinations including St. Thomas, U.S. Virgin Islands; Tortola, British Virgin Islands and Nassau, Bahamas. Norwegian Escape’s signature hull artwork is designed by marine wildlife artist and champion of ocean conservation, Guy Harvey. Norwegian Escape’s dining and entertainment will include outposts of several popular land-based outlets, including the first-ever floating Jimmy Buffett’s Margaritaville restaurant and 5 O’Clock Somewhere Bar, a music venue and outdoor bar on The Waterfront that will feature live nightly performances. James Beard Award-Winning Iron Chef Jose Garces will have two concepts on board, a Latin seafood speciality restaurant and Pincho Tapas Bar, while Miami-based The Pubbelly Restaurant Group will develop the menu for the Food Republic, an upscale food emporium. The District Brew House, a hip, urban craft beer hall featuring an exclusive partnership with Miami’s own Wynwood Brewing Company, will serve up more than 24 draft beers while The Cellars, A Michael Mondavi Family Wine Bar, features an array of immersive wine experiences, focusing on tasting, education, and the enjoyment of wine. Norwegian Escape will also feature Miami’s oldest and most legendary bar, Tobacco Road. Continuing with Norwegian’s commitment to excellence in entertainment, Norwegian Escape will feature two Tony Award-winning Broadway musicals headlining in the Escape Theatre: After Midnight, the smash-hit musical that combines the big-band songs of Duke Ellington and the best dancing from Broadway; and Million Dollar Quartet, the smash-hit musical inspired by the famed recording session that brought together rock’n’roll icons Elvis Presley, Johnny Cash, Jerry Lee Lewis and Carl Perkins. In a new concept exclusive to Norwegian Escape, the Supper Club has been re-imagined for an unforgettable dinner and show. For The Record: The Brat Pack™ is a critically acclaimed Hollywood night that celebrates classic soundtracks of motion picture masters in a one-of-a kind 360° post-modern cabaret. The ship will feature the largest ropes course at sea, a three-storey multiplex of heart-pounding challenges complete with two planks and five Sky Rails, zip tracks that allow guests to soar through the air. Norwegian Escape’s Aqua Park will be the largest at sea and includes a new Aqua Racer slide. Adding to the family fun, Norwegian Escape will also feature an expanded Kids’ Aqua Park, along with the line’s first dedicated nursery for young cruisers two and under. Accommodation includes the company’s largest signature luxury ship-within-a-ship complex: The Haven by Norwegian®; along with Studios, designed and priced for solo travellers; and many options for families, multi-generational groups, spa enthusiasts and more. Founded in 1966, Norwegian Cruise Line is the innovator in cruise travel with a history of breaking the boundaries of traditional cruising, most notably with the introduction of Freestyle Cruising which revolutionized the industry by giving guests more freedom and flexibility. Today, Norwegian invites guests to “Cruise Like a Norwegian” on one of 13 purpose-built Freestyle Cruising ships, providing guests the opportunity to enjoy a relaxed cruise holiday on some of the newest and most contemporary ships at sea. In August 2014, the line was named “Europe’s Leading Cruise Line” for the seventh consecutive year, as well as in October 2014, for the second consecutive year, “Caribbean’s Leading Cruise Line” by the World Travel Awards. In addition the company has received the World Travel Award as “World’s Leading Large Ship Cruise Line” from 2012 to 2014. Norwegian Cruise Line’s largest Freestyle Cruising ship to date, Norwegian Epic, debuted in June 2010 and, in the United States, has been named “Best Overall Cruise Ship” by the readers of Travel Weekly two years in a row and “Best Ship for Sea Days” by Cruise Critic. The Company recently took delivery of its most innovative ship to date, the 4.000-passenger Norwegian Getaway in the first quarter of 2014. The Company has four 4.200-passenger vessels on order at Meyer Werft: Norwegian Escape with delivery scheduled in the autumn of 2015, Norwegian Bliss with delivery in the spring of 2017 and two further ships with delivery in the spring of 2018 and autumn of 2019. This entry was posted in Cruises, Transportation, Travel, Travel Marketing, Travel Services, Travelers and tagged Andy Stuart, Norwegian Cruise Line, Norwegian Escape. Bookmark the permalink.